Musings about autographs, comic books and other neat stuff. After a year or more of struggling with sporadic posting, I'm calling it quits. The blog thing was fun for a while, but frankly, I don't have anything new to say. It should be fun, and when it turns into a chore, it's time to sign off. I will keep everything up and hopefully this can serve as a resource for people new to the scene. Plenty of scam info and juicy reading in the archives. Best of luck to all, thanks for reading, and farewell. For now, at least. This is how one CGC Message Board member received a lot of 20 comic books he won on eBay. You'd think it would be common sense, but do you have to ask sellers now to "not ship my winnings in a cereal box?" Check out the Robin Shock Pose Generator. Try it with comics as well as family photos for hours of great fun! More to follow. Soon. I promise. Ok, I got it at a great price and couldn't resist this Golden Age gem. Thanks to SoCal and Esquire Comics who were offering a run of Batman 1 - 100 at very reasonable prices. 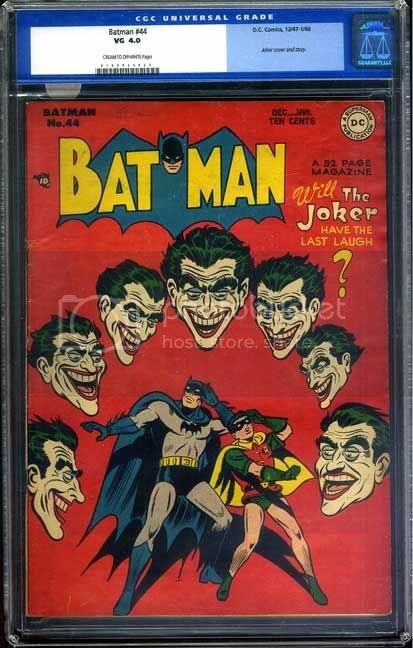 I like it so much, I'm going to have to put a bunch of Golden Age Joker covers on my want list. 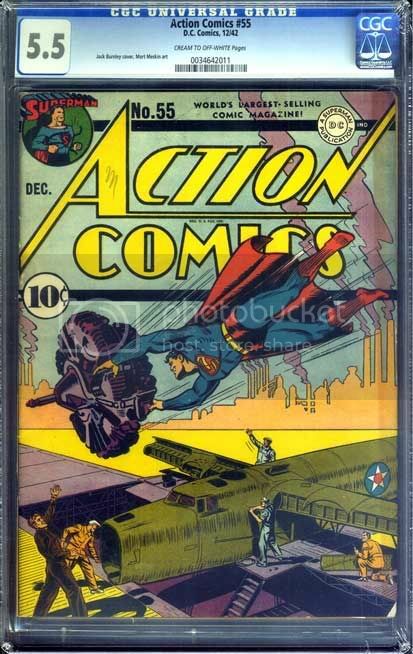 Recently, a previously unknown collector came out on the CGC Message Boards and started displaying comics from his utterly mind-boggling, high-grade Golden Age collection. Several noted Golden Age experts commented that this collection features some of the best examples of certain books that they'd ever seen. The still anonymous collector stated that, in 1971, he purchased an original owner collection of 1,000 high grade Golden Age comics for $7,500... or $7.50 a book for some of the finest examples in existence. Interestingly, the person this collector purchased the books from had found them bundled on the curb waiting to be taken with the garbage! The fact that a collection like this has survived unknown to the community at large makes one wonder how many other outstanding personal collections may be squirreled away, still waiting to make a public debut. By the way, the owner of this collection has no interest in selling at this time. 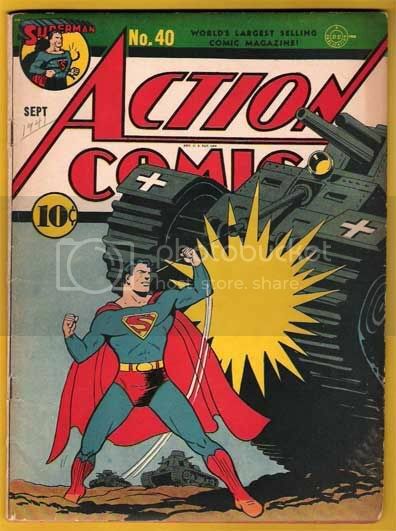 Another Action Comics war cover off the wantlist! Typically, I'm not one to buy into the Variant Cover madness which has returned to the comic collecting hobby just as the chrome and hologram covers did a decade ago. I suppose it's only a matter of time before it all comes crashing down again. With the prevalence of variants, multiple covers, and superstar artists calling the shots, there are plenty of people already predicting the imminent demise of the modern market. 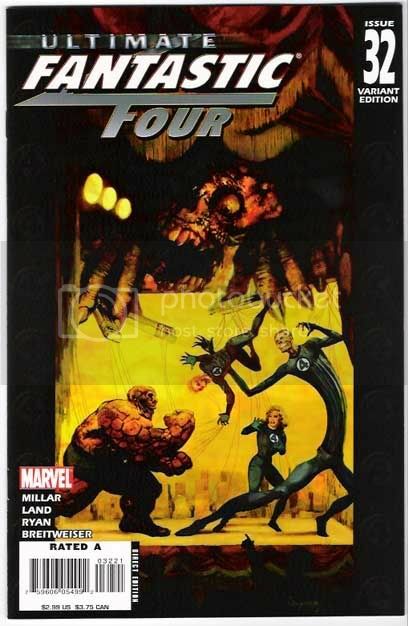 That said, I couldn't resist the Arthur Suydam Zombie variant cover to Ultimate Fantastic Four 32... it's a fun homage -- or swipe -- of the Silver Age classic Fantastic Four #8 originally drawn by Jack Kirby. This cover is a 1:15 variant. Long time space dealer and collector Gerry Montague has finally joined the Internet Age and developed a website -- Astronaut Archives. My God, this is great. Pay special attention to the ignorant, bloated face of the unrepentant scammer. Don't you just want to smack the ugly right off her face? With all the coverage of the late President Ford, one aspect that surely won't be discussed is that President Ford was a dear friend to autograph collectors. The President signed freely for many years and was most generous. It wasn't until he suffered a stroke several years ago that he started turning down requests for his signature. 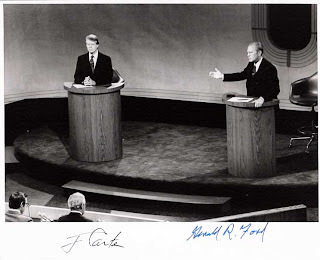 I was fortunate enough to receive a number of signed items from him, including this photo from the first Presidential Debate of the 1976 election. Perhaps my favorite however, is a large signed engraving of his portrait. Copyright 1999 - 2017, Steve Zarelli. Images copyright their respective owners. Picture Window theme. Theme images by sololos. Powered by Blogger.